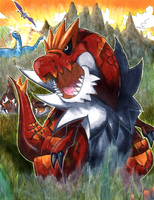 One of the two fossil pokemon featured in Pokemon X and Y. According to Bulbapedia, it's 2.70 metres. I love the way you drew Aurus. Amura and Aurorus are my favorite fossil pokemon from X and Y. Cool picture. I like Aurous a lot. It stands at 8' 10". Not super huge like the dinosaurs it was based on but still tall. I too, loved Dinosaurs and instantly fell in love with this Pokemon when I saw it. >w< Aurorus is aaaaamaaaaaaaaaazing! Also, beautiful picture! Aurorus is one of my favorite pokemon! Its a shame he gets taken out by just about ANY fighting or steel type move. Late to the party but he absolutely WRECKS the last of the E4 in that game... Fairies beware, my dino is better. Cool! If I ever play X or Y, I'll get this fossil pokemon and name it Little-foot. *walks away from 3ds* I'm out. Really love the perspective and the colors! I'm hoping to raise one on my team, they've become one of my favorites. I have seen this in so many places I HAD NO IDEA IT WAS YOURS! how do u make that heart face thing? Try to think what it will look like in real life. *Pretends to see it* HOLY ACRUS! THAT THING IS HUGE! No problem. I should mention that I super love (my) Aurorus. She's so much a beast. Single Pokemon Bolt Beam, or Thunderbolt/Hail/Blizzard as it stands now. Excuse me, do you mind if I use this picture for a custom 3DS skin? Another amazing submission! This is definitely one of my favorites as of so far! Oh, wow! I love how you used perspective to your advantage and really made Aurorus look colossal! This one is my favorite Mark!